Use any of our high converting display types and landing pages, no matter what plan you're in. Pop-ups, also known as lightboxes, typically display in the center of your website and are great at attracting attention from your visitors. Pairing a pop-up with clever verbiage or a specific campaign, like a discount or a unique piece of content is a powerful way to gather that email address. Bars provide a full-width message that typically sits either on top of your site, or at the bottom. 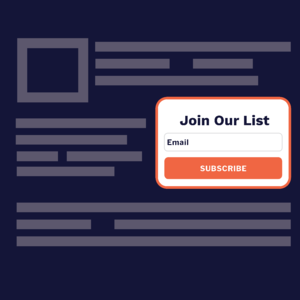 If you want a more subtle email collection form, a bar sitting at the top or bottom of the page is a great option. Bars are great for capturing emails as well as for subtly promoting things like free shipping, customer satisfaction guarantees, and new products. Spin to Win is a new, highly engaging way to grow your email list by distributing coupon codes in exchange for a email addresses and other information. With Spin to Win, visitors to your site are asked to enter their email address for a chance to spin the wheel to win one of 12 prizes. 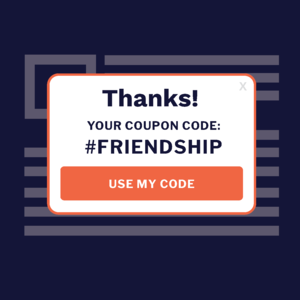 Whichever slice of the wheel they land on displays a coupon code on the thank you page that they can use in your online store. 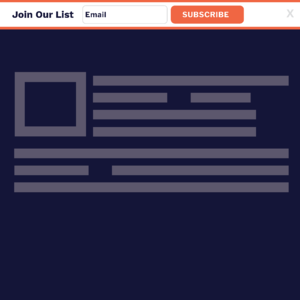 Flyouts appear in the bottom right or left of a screen and are a bit more subtle than a pop-up, but more likely to draw the attention than a banner or embed form because they include movement. Flyouts are particularly great for visitors who are in the middle of executing a task or reading a long-form page, like in the blog section of your site or on a product detail page. Banners provide a more subtle interaction that sits at the top or bottom of a site, but starts in a "hidden" state until triggered, then rolls into sight at the desired time. With attention-grabbing movement, a banner offers a less invasive choice than a pop-up but still includes movement that attracts the eye of your visitor. 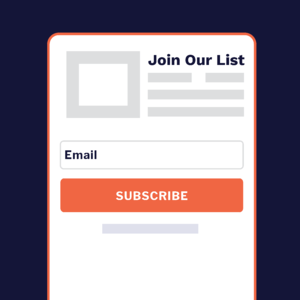 Embedded forms let you place a static sign-up form on your website to capture email addresses and other relevant information and are a great complimentary piece to your other campaigns. and make for an excellent permanent installation in your footer or sidebar. Landing pages function differently from Popups and other campaign types. The main difference is that it does not display on your site. Instead, a landing page is a self-contained campaign that you can direct your contacts to via a link. This is especially helpful in situations when you want to share a campaign across social media channels. Designing your landing page can be done in a few easy steps. 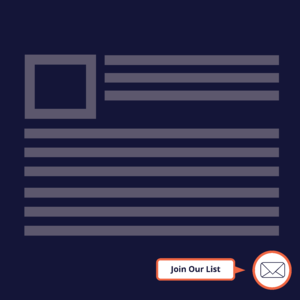 Adding tabs to your campaign makes it easy for someone to access your display when it is not open by having a small, customizable, and always present call to action that opens the display.